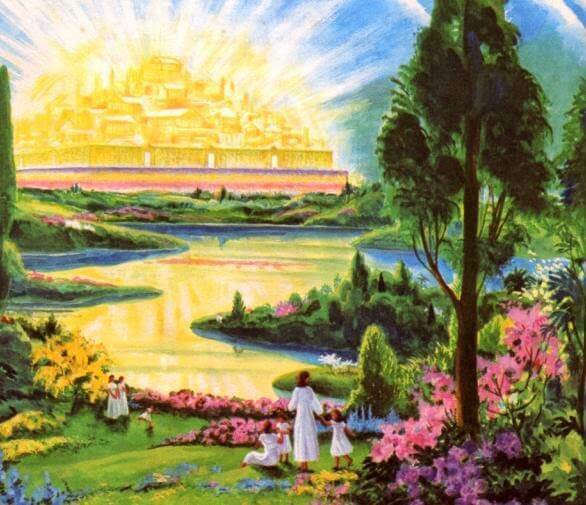 We have all grown up with the picture of heaven with streets paved with gold, surrounded by crystal glass seas, and living in a mansion of gold upon the Glory Hill, right? 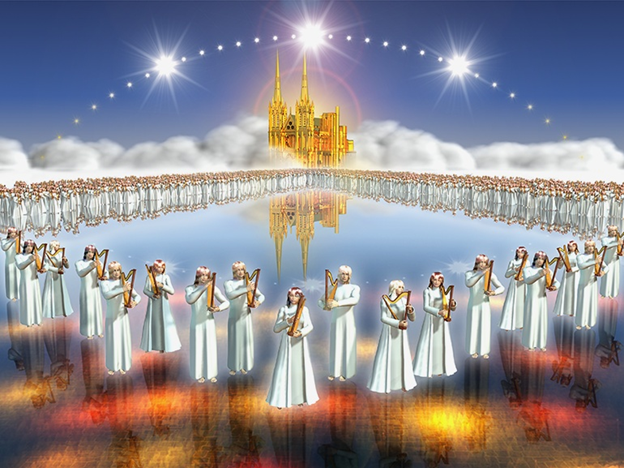 We have pictures of angels singing and playing their harps, while people of every tongue and nation gathered around the throne in white robes. Apostle John shared his vision of heaven in the Book of Revelation. The Lord Jesus took him away in the spirit after he was persecuted for his faith in Christ, then banished to the island of Patmos. What John wrote for us in the Book of Revelation was spiritual. He wrote in pictures, metaphors, and symbols to express the wonders he beheld! For our blog this week, I want to bring clarity to a few things we were taught over the years that were not true, yet, keeping in mind the awesomeness of our eternal abode with God the Father, Our Lord Jesus Christ, and Our Precious Holy Spirit in our Home called, Heaven. John 14: 2-3 – In My Father’s house are many mansions (dwelling places). If it were not so, I would have told you, because I am going there to prepare a place for you. 3 And if I go and prepare a place for you, I will come back again and I will take you to Myself so that where I am you may be also. Many of us believe and have been taught when Jesus is talking in John 14:2-3 we are going to live in a great home of brick and mortar, or a mansion with Jesus when we die. Many Mansions – In King James’ day, a mansion was a room, not a huge, fancy house. Today, most translations say “many dwelling places” (NRSV), or “plenty of room,” as the TNIV helpfully puts it. Jesus’ central meaning is this: There is plenty of room with God. Jesus speaks out of the context of the whole Old Testament’s revelation. In the Old Testament, the Lord’s “house” or “dwelling place” is an immensely rich idea. It essentially means the place or places where God’s presence is manifested. Often, in the Psalms, God’s “house” or “dwelling” is the temple in Jerusalem. Other times it refers to the whole creation or even the whole universe. But, in the New Testament, He refers to believers as “The Temples of the Holy Spirit” where God dwells. God’s “house” or “dwelling place” is wherever God is and wherever His presence is made evident and His will is done. Jesus assumes this in many of His discourses. The meaning of John 14:2 is, “There is plenty of room with God” for every lost soul, He calls out to ALL of mankind. A Heavenly Place Is Within Us Right Now! I go to prepare a place for you.” Jesus assures His apostles that in going away (through his crucifixion and death), He is accomplishing the next step in God’s plan for His kingdom to come in fullness and His Holy Spirit to come and live within every believer In Him. Within our earth suits made of clay, our bodies… living within us right now, in our spirits and souls is Heaven! The Kingdom of God where our Father, Lord Jesus, and Holy Spirit dwells and lives. Our bodies are decaying, but our spirits and souls are being renewed day by day, 2 Corinthians 4:16. We are experiencing, now, just a foretaste or appetizer, of all we will experience in the Fullness of God when we leave our earth suits (earthly bodies) behind. The full course meal is yet to come! 2 Corinthians 5:5-6 [The Temporal and Eternal] – For we know that if the earthly tent [our physical body] which is our house is torn down, we have a building from God, a house not made with hands, eternal in the heavens (in our spirits). For indeed in this house we groan, longing to be clothed with our [immortal, eternal] celestial dwelling, so that by putting it on, we will not be found naked. … TO BE ABSENT FROM THIS BODY IS TO BE PRESENT WITH THE LORD… THE ONE WHO HAS BEEN WITH US ALL ALONG! Of course, when we leave this temporary home, our earth suit, we will live in an immortal home or spiritual body with our Lord. The Book of Revelation paints an amazing picture for our natural minds to understand. However, it is only a picture. In our spiritual bodies, we will experience the FULLNESS OF HEAVEN and what John was trying to portray in natural words. In the book of Revelation, there are many accounts of heaven, a place where we will live forever in infinite, immortal bodies. We will know each other and be known by each other. The New Heaven and Earth – Read Revelation Chapters 21 and 7 to Learn More. In conclusion, the mansion Jesus spoke of in the Book of John, is the same building Paul speaks of in 2 Corinthians. WE ARE THE DWELLING PLACES OF GOD! We are God’s TEMPLE AND HOUSE WHERE HIS PRESENCE DWELLS FOREVER. Heaven lives within us right now! When we die or when our Lord returns, we will change clothes; our mortal bodies will put on immortality, our spiritual bodies and we will rule and reign with Christ throughout eternity in the place we have always known a spiritual place we call Heaven.